As I write the title to this post I'm aware it doesn't sound a big turn on. Leftover fish. Hmmmm. But trust me, it was good. First of all the fish wasn't cooked, merely the odd bits and pieces that hadn't found their way onto the kebabs that our friend Rich's mate Chris was rustling up for a big family barbecue (mainly tuna and swordfish). Chris is a chef so you'd expect him to come up with something good but this was an impressive use of the scant contents of a holiday villa storecupboard. The great thing about fish curries is that people who profess not to like fish much will eat them. You can also use those frozen fish steaks that look unappealingly rectangular on their own but are fine cubed and/or throw in a few cheap frozen prawns or those frozen seafood mixes. Back from the Emerald Isle which was indeed looking very green after all that rain. I had a really great trip and a fabulous birthday - the best I can ever remember. Believe it or not I'm off again in 36 hours, this time to France to try and establish whether my mother-in-law can manage to go back home after her fall a couple of months ago or whether she'll have to go into a home which she understandably doesn't want to do. Tricky. Oh, the joy of a good apple pie! I wish I could say I'd cooked it myself but these are the apple pies they make at the Farmgate café in Midleton, Co. Cork. There's something very special about an Irish apple pie. The filling is a wonderful chunky mound of sweet fruit, the pastry wafer thin and crisp with a lavish dusting of caster sugar. It's much lighter and less stodgy than an English apple pie. Judging by this recipe the crucial difference is that they use eating rather than cooking apples and a high proportion of fat to flour - plus some sour cream. I'm off cooking duty this week but shall have to have a crack at it when I get home. We're over on 10 days holiday celebrating a Big Birthday (Mine. One of those ones with an 0 at the end) and I can't believe how expensive Irish restaurants are. The main courses in the restaurants in Wexford we looked at last night were all between 20 and 30 euros, pretty well London prices and certainly much more than we would pay in Bristol. Wine, which is hugely popular in Ireland, is really pricey too. Fortunately breakfasts such as the wonderful one we had this morning at McMenamin's (above) are so lavish that one doesn't need lunch so I reckon a strategy of blow-out breakfast, afternoon tea and one course for dinner will get us by until we get to the house we've rented. Lovely place though. Couldn't meet nicer people. Following my earlier moan this week about cheap cuts I passed what looked like a halal butcher yesterday in Shepherds Bush in London which was selling all kinds of inexpensive cuts of lamb from an amazing £1.24 a lb. It was also really well trimmed of fat. We used to buy halal meat occasionally from a Bangladeshi grocer where I lived in St Albans and it was particularly good for stews, tagines and curries. I didn't have time to explore yesterday but there are loads of really cheap places to shop round Shepherds Bush including several middle eastern greengrocers and a flourishing street market. The unrelenting gloom and unseasonal temperatures made me feel like making a stew on Saturday when we were having friends round so I bought four big pieces of organic short ribs or 'pot au feu' as our local butcher calls them. It was a bit of a shock when they came to over £12 but by that time I'd got so carried away with how good they were going to taste I couldn't bring myself to buy something else. And it was great, and it did serve 6 which is only £2 a head (well, probably £2.50ish with the veg and the wine) far, far cheaper than anything you'd get in a restaurant. But it blew a big hole in our weekend food budget which led to us not buying the chicken we were thinking of having yesterday. It is, it has to be said, one of the few disadvantages of buying from a butcher rather than a supermarket. In a supermarket you know exactly what you're getting and how much it's going to cost. In a butcher you've already entered into the transaction by picking your meat and asking them to weigh it and with several people standing behind you you have to be feeling unusually resolute (or desperate) to ask them to put it back. It's not the first time I've found that so called 'cheap cuts' can add up a bit, particularly when they're on the bone. Lamb shanks are now a shocking price. Osso buco which I'm sure used to be a frugal Italian cut, equally so. Only scrag end of lamb still seems to be good value and that's almost certainly because of the unappealing name. What's your experience of buying cheaper cuts? This is my favourite breakfast at the moment - well, most of the year, actually, but fresh raspberries happen to be in season and reduced at most of the supermarkets currently. A handful of raspberries, a heaped tablespoon of plain yoghurt (we use soy as my husband is dairy-intolerant) and a sprinkling of granola. It looks especially pretty layered up in a tumbler like this, a form of presentation the French are particularly keen on and call a 'verrine'. You can also of course make it with thawed frozen berries - cheaper for most of the year - or with a cooked fruit compote. We have it with apple and cinnamon, blackberry and apple, plums and rhubarb at different times of year. Not expensive and a great way to start the day. The great thing about it is that students can upload recipes and videos direct and we've already got some great ones on the page. One which has caught my eye is a video of a 'Really Moist Chocolate Cake' which was submitted by 15 year old Rebecca Carey who recently won the Guild of Food Writers young cookery writers competition 'Write It'. What's interesting about the cake is that it contains a good dollop of yoghurt (hence the moistness) and soft tub margarine. Now that's a blast from the past! It's also a great deal cheaper than using butter. I checked out my local Sainsbury's yesterday and found that Stork was selling at 69p for 500g, far cheaper than spreadable butter or indeed many of the new butter-imitating spreads. You wouldn't want to use it for spreading on bread but there are plenty of alternatives. You can buy a tub of Sainsbury's Buttersoft Slightly Salted for £1.70 for 500g which is cheaper than any of the spreadable butters. The cheapest block butter in Sainsbury's was 85p for 250g. I'd still use that for cooking but I think if I had a family to feed and was trying to cut my food budget I'd definitely be working my way round the spreads to find one I liked. What do you use for eating or cooking? Would you, do you use marge or one of the oil-based spreads? And what do you use for baking? We haven't quite got our act together since we got back on Friday so found ourselves scouring the local shops at 4.30 for something for supper tonight. I'd forgotten there are often good bargains at this time on a Sunday. Where we used to live in St Albans the Sainsbury's Local at the petrol station down the road used to have brilliant reductions such as a whole chicken for £1.99 or a piece of steak for £1.25. Prices were sometimes reduced by as much as 70%. Bet they don't hang about on the shelves for long now. Back to Blighty yesterday to be greeted by a full page ad in the Times (and probably other papers too) publicising Sainsbury’s ‘Big 5’ deals on fruit and veg. Which bears more than a fleeting resemblance to Aldi’s weekly fruit and veg promotion, the Aldi Super 6. Could it be that the big boys are getting rattled by the migration of an increasing number of newly budget-conscious customers prepared to give the discounters a go? I suspect it could. According to recent figures from the market research company TNL Aldi’s sales increased over 20% in the 12 weeks to the 15th of June, giving it its highest ever share of the UK grocery market at just under 3%. Those sales have to be coming from somewhere. How good are the Sainsbury’s bargains though? Well, as usual, a mixed bag. No-one could complain at 49p for a melon (20p less than Aldi’s) or 39p for a bag of radishes but new potatoes still sound expensive at 89p a bag (it doesn’t specify the weight)and berries may or may not be good value depending on whether you’re paying the 99p or £1.99p mentioned in the ad. Half price, as I've pointed out before, is not such a big deal if the price was excessive in the first place. And some of you have pointed out even better bargains outside London. So let’s have a ‘bargain of the week’ contest. 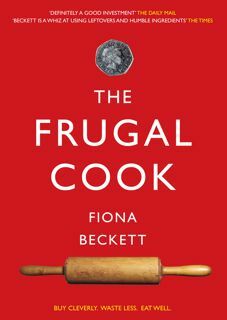 Whoever comes up with the best deal this week gets a signed copy of my book The Frugal Cook when it’s published next month! Fire away . . .